Scream 2 is a 1997 American slasher film directed by Wes Craven and written by Kevin Williamson. It stars Neve Campbell, David Arquette, Courteney Cox, Sarah Michelle Gellar, Laurie Metcalf, Jamie Kennedy, Jerry O'Connell, Jada Pinkett and Liev Schreiber. The film was released on December 12, 1997 by Dimension Films as the second installment in the Scream film series. The film takes place two years after the first film and again follows the character of Sidney Prescott (Campbell), now a student at the fictional Windsor College, who becomes the target of a copycat killer using the guise of Ghostface. Sidney is accompanied by film-geek Randy Meeks (Kennedy), retired deputy sheriff Dewey Riley (Arquette) and news reporter Gale Weathers (Cox). Like its predecessor, Scream 2 combines the violence of the slasher genre with elements of comedy and "whodunit" mystery while satirizing the cliché of film sequels. The film was followed by two sequels, Scream 3 (2000) and Scream 4 (2011). Williamson provided a five-page outline for a sequel to Scream when auctioning his original script, hoping to entice bidders with the potential of buying a franchise. Following a successful test screening of Scream and the film's financial and critical success, Dimension moved forward with the sequel while Scream was still in theaters, with the principal cast all returning to star, Craven to direct and Beltrami to provide music. The film suffered controversy following its significant issues with plot information leaking onto the Internet, revealing the identity of the killers. Combined with the film's rushed schedule, the script was rewritten often; pages were sometimes completed on the day of filming. Despite these issues, Scream 2 earned $172 million at the box office and received several awards and nominations. The film also received positive reviews, with some critics arguing that the sequel surpassed the original in terms of quality. Beltrami received positive critical reception for his score for evolving the musical themes of the characters created in Scream although some critics claimed that the most memorable pieces from the film were created by composers Danny Elfman and Hans Zimmer. Elfman's contribution had been specially written for the film, but Zimmer's score for Broken Arrow was controversially used in the film, replacing Beltrami's own work. The soundtrack received negative feedback from reviewers but achieved moderate sales success, reaching #50 on the Billboard 200. After dusk, Windsor College seniors, Maureen Evans and Phil Stevens (Jada Pinkett and Omar Epps) attend a sneak preview of the new film Stab, a film within a film based on the events of the first film. During the movie, Phil drops by the restroom where he eavesdrops on strange whispering noises in the bathroom stall. As he listens closely, a killer in a ghost mask, revealing to be Ghostface, stabs him in the ear, killing him. Ghostface then returns to the screening and sits beside Maureen. Maureen unknowingly thinks it's Phil trying to scare her until she touches his coat, which is covered in blood. As she studies her hands for a moment, Ghostface fatally stabs her. At first, the audience believes the act to be a publicity stunt until she falls dead in front of the cinema screen. The following day, the news media, including local journalist Debbie Salt (Laurie Metcalf), descend on Windsor College where Sidney Prescott (Neve Campbell) now studies alongside her best friend Hallie McDaniel (Elise Neal), her new boyfriend Derek Feldman (Jerry O'Connell), fellow Woodsboro survivor Randy Meeks (Jamie Kennedy), and Derek's best friend Mickey Altieri (Timothy Olyphant). Two other Woodsboro survivors arrive at the campus: officer Dwight "Dewey" Riley (David Arquette) to help Sidney, and reporter Gale Weathers (Courteney Cox) to cover the case. Gale tries to stage a confrontation between Sidney and Cotton Weary (Liev Schreiber), who is attempting to gain fame from his exoneration for the murder of Sidney's mother, Maureen Prescott. After Gale forcibly confronts Sidney with Cotton, Sidney angrily hits Gale on-camera again. Later that evening, Sidney goes to a party with Hallie. At a sorority house, Ghostface murders fellow student Cici Cooper (Sarah Michelle Gellar). After all the partygoers leave, Ghostface then crashes the party and attacks Sidney, though Derek intervenes. Ghostface injures Derek but Dewey and the police arrive, prompting the killer to flee. The next morning, Gale discusses the case with the police. Upon realizing that Cici's real name is Casey, she concludes that the new Ghostface is a copycat who targets students who share the same names as the Woodsboro murder victims two years ago. That afternoon, while Gale is talking to Dewey and Randy on the campus lawn, she receives a call from Ghostface hinting that he is watching them. Gale and Dewey decide to search for him, and Gale gives Randy her phone to keep him talking. As Gale and Dewey are looking around the campus, Randy is dragged into Gale's broadcast van and is brutally stabbed to death by Ghostface before having his throat slit. As night falls, Dewey and Gale review the tape of Ghostface killing Randy hoping to find some clues, but the killer attacks them and supposedly kills Dewey. Gale hides and eventually escapes. In the wake of the escalating murders, two protective officers drive Sidney and Hallie to a local police station, but Ghostface murders the officers as Sidney and Hallie begin to panic. In the ensuing struggle, Ghostface is knocked unconscious. After they climb out of the car, Sidney insists on unmasking him, while Hallie insists they escape. When Sidney walks back to the car, she sees that Ghostface has escaped instead. Ghostface emerges from beside Hallie, stabbing her to death, forcing Sidney to flee. Sidney goes back to the campus and finds Derek in the auditorium tied to a crucifix, his mouth gagged with duct tape. Sidney begins to untie him when Ghostface arrives. The killer uses the voice to reveal before unmasking as Mickey and kills Derek. Mickey discusses his plan to become famous in the ensuing trial and media spectacle. He then announces his partner, Gale, but behind her, Debbie Salt, who arrives holding Gale at gunpoint. Sidney discovers that Debbie Salt is actually Billy Loomis' mother, seeking revenge for her son's death. Mickey explains that they met online and that Mrs. Loomis agreed to pay for Mickey's tuition fee while Mickey does the actual killing - with the exception of Randy's, who Mrs. Loomis claims responsibility for. Mrs. Loomis betrays Mickey and shoots him, as she plans to blame the murders on Mickey. Before he collapses, Mickey accidentally shoots Gale, causing her to fall off the stage. Sidney and Mrs. Loomis fight, until Cotton intervenes and eventually shoots Mrs. Loomis in the throat. As they debate whether or not she is dead, they find Gale still alive. Mickey suddenly jumps to his feet, attempts to attack them, only to be fatally shot by Sidney and Gale. Sidney then shoots Mrs. Loomis in the head just in case she also jumps to her feet. When the police arrive the next morning, Sidney instructs the press to direct questions to Cotton, rewarding him with the fame he has been chasing while removing the attention from herself as she leaves the university campus. Laurie Metcalf as Mrs. Loomis/"Debbie Salt"
Luke Wilson and Heather Graham cameo as actors in the in-universe Stab film. Tori Spelling appears as herself, and Joshua Jackson cameos as one of Randy's classmates. While writing the script for Scream, Williamson also developed two five-page treatments for potential sequels. Following the release of Scream, Williamson would confirm that he had considered a sequel concept where the character of Sidney Prescott would now be attending college and a copycat Ghostface killer would start a new series of murders. Dimension Films agreed to pursue the sequel in March 1997, by which point Williamson already had forty-two pages of the plot developed which involved four different killers, Derek, Hallie, Cotton Weary, and Mrs. Loomis, who is the mother of one of the previous film's killers. By July 1997, filming began on Scream 2 but after Williamson transferred his script to the production it was leaked onto the Internet in full, revealing the identity of the killers and a large amount of the involved plot. This resulted in the production continuing to film with only a partial script while Williamson conducted extensive rewrites, changing much of the film's finale, the identities of the film's killers and drastically altering the roles of other characters such as Randy Meeks and Joel. To avoid another such incident and prevent sensitive plot details being revealed through other means, the actors were not given the last pages of the script until weeks before shooting and the pages that revealed the killer's identity were only provided on the day the scene was shot to the actors involved. The short production schedule on Scream 2 and his work on other projects meant that Williamson's final script used for the film was detailed in some areas but lacking in others, with Wes Craven forced to write and develop certain scenes as they were being filmed. In 2017, Williamson claimed the leaked script was a "dummy draft" that was crafted specifically to avoid leaked details. Williamson claimed there were three dummy endings written. "They were worried the killer's identity would be leaked, so we wrote several endings. Three in all, if memory serves, and when actors and potential crew members asked to read the script, we would send the script with the dummy ending ... There was even a fake ending where Dewey was the killer. They existed as a decoy and nothing more. Extreme measures, but we really wanted to keep the killer's identity a secret!" Williamson had been contracted for two potential sequels to Scream when selling the script for the original, based on five-page proposals he attached to the script, hoping to entice prospective buyers with the fact that they were not just buying a film but a franchise, and after a successful test screening for the original, at which Miramax executives were present, Craven was also given a contract to direct the two future films. Dimension Films considered pursuing development of a sequel in January 1997 after Scream proceeded to gross more than $50 million in the first month of its release, with production being greenlit in March 1997 and an increased budget of $24 million over Scream's $15 million. The production of the film suffered a significant setback when the script was leaked, revealing plot details including the identity of the killers, resulting in the script being modified to change many details. In an interview, Craven commented on the rushed six-month production schedule, with the film being expected ready for release on December 12, less than a year after the release of Scream, and Williamson forced to rewrite his script, pages for scenes would often only be ready on the day of filming and others lacked significant detail that forced Craven to develop them as the scenes took place. Various titles were considered for the sequel at different points in the film's production, including Scream Again, Scream Louder and Scream: The Sequel before the studio decided to simply use Scream 2. Neve Campbell had been contracted to reprise her role as heroine Sidney Prescott in a potential sequel before filming had even begun on Scream, her character being the only one from the original film guaranteed to survive and lead a new film. Once production of a sequel was seen as inevitable, following the success of Scream, Dimension Films added sequel options for the actors whose character had survived the previous film; Courteney Cox as ambitious news reporter Gale Weathers, David Arquette as retired deputy sheriff Dewey Riley, Jamie Kennedy as film-geek Randy Meeks and Liev Schreiber as Cotton Weary, the man exonerated for the murder of Sidney's mother. Roger L. Jackson also returned to voice the character of Ghostface. Having finalized the returning principal cast from Scream, the production approached their casting for Scream 2 in a similar manner, seeking established and popular actors, largely sourcing from TV shows of the time. In interviews, the production staff of the film remarked that they found approaching and securing the talent they wanted significantly easier than it had been for Scream, considering the financial and critical success of the film but also believing the prior involvement of Drew Barrymore had lent the horror genre an element of credibility which made serious actors eager to become involved. New cast included Sarah Michelle Gellar as sorority sister and film fan Cici Cooper, Elise Neal as Sidney's friend and roommate Hallie, Jerry O'Connell as Sidney's boyfriend Derek, Timothy Olyphant as Mickey and Laurie Metcalf as local reporter Debbie Salt, later revealed as Mrs. Loomis, mother of Billy Loomis from Scream. Many of the actors involved in the production, including Campbell, Cox, Gellar, and O'Connell were starring in their own television series at the time, allowing the production limited availability to schedule their involvement. Gellar in particular was in-between filming of Buffy the Vampire Slayer and had only recently finished work on another Williamson-penned film, I Know What You Did Last Summer (1997). Despite the hectic scheduling, Gellar admitted in an interview that she agreed to perform in Scream 2 without having read the script because of the success of Scream. Metcalf had only just finished her nine-year run on the popular sitcom Roseanne when she began work on Scream 2 and Craven was praising of her ability to portray the deranged Mrs. Loomis. To obtain the role of Derek, O'Connell and other candidates had to audition by performing a scene from the film where the character sings "I Think I Love You". Olyphant's involvement as Mickey was his first leading role in a feature film. Despite scheduling difficulties, Craven took their desire to participate in the film despite their workload as a compliment to the film's quality. The cast was rounded out by Lewis Arquette, father of David Arquette, as a local Sheriff in charge of investigating the new murders, Duane Martin as Gale's cameraman Joel, Jada Pinkett and Omar Epps as Maureen Evans and Phil Stevens, patrons of the fictional "Stab" film who become the film's opening victims, and Portia de Rossi and Rebecca Gayheart as sorority sisters Murphy and Lois. Gayheart had auditioned for the role of Tatum Riley in Scream and auditioned multiple times for Scream 2 for the roles of Cici Cooper, Hallie and Maureen Evans before obtaining her eventual role. Minor roles were filled by Chris Doyle and Philip Pavel as Officer Richards and Officer Andrews, assigned to protect Sidney, veteran actor David Warner as Sidney's drama teacher, and Nancy O'Dell as an unnamed reporter who would reprise the role in future installments of the series. Tori Spelling, Luke Wilson and Heather Graham played themselves as characters in the "Stab" films; credited as Stab Sidney, Stab Billy and Stab Casey respectively. Spelling was cast based on a sarcastic remark by Campbell's character in Scream that she would be played by Spelling in a movie based on her life. Craven remarked that she was a "good sport" about the joke and happy to take part. Principal photography for Scream 2 took place over a nine-week period beginning in June 1997 and on a budget of $24 million. Atlanta, Georgia and Los Angeles were used to represent the state of Ohio, where the fictional Windsor College is situated in Scream 2, with filming taking place largely in Los Angeles and over four weeks in Atlanta. The opening scene featuring the premiere of the fictional "Stab" film was filmed over three days in the Vista theater on Sunset Drive, Hollywood, the exterior represented by the Rialto theater in South Pasadena, California. Due to the large number of extras present in the scene, full details of what occurred were leaked onto the Internet shortly after filming completed which Craven cited as the production's first experience of a major plot leak. The sorority homes used by the character Cici Cooper and a nearby party were also filmed in Pasadena, east of Los Angeles. The fictional "Stab" film itself was filmed in Malibu, California. Agnes Scott College, just outside Atlanta, and UCLA in Los Angeles were used to represent the fictional Windsor College which appears in the film. Following a script leak early into filming, security around the production was significantly increased, with a focus on closed filmsets and strict restriction on what personnel could be present during filming and have access to the script, with all present required to sign non-disclosure agreements. The script itself was reprinted on specialty paper to prevent photocopying and was often destroyed after use. Craven had difficulties passing Scream through the film-rating body MPAA to receive an R-rating to help the film remain commercially viable, sending eight different cuts and requiring the direct intervention of Dimension Films founder Bob Weinstein to eventually get the necessary rating to release the film without significant cuts. Eager to avoid the same experience on Scream 2, Craven attempted to manipulate the MPAA by sending them a version of the film that had been edited to focus on and enhance the gore and violence present beyond what they actually wanted in the film, including reusing a clip of Omar Epps' character being stabbed in the ear three times, instead of only once as seen in the final film, and an extended scene of Randy Meeks death that showed his throat being slashed. Craven's reasoning was that the parts of the film they wished to keep would be more acceptable when viewed with the enhanced violence and so the MPAA would force them to remove the footage they already did not want to keep while passing the content they did want. However, the MPAA granted Scream 2 an R-rating for the more violent cut as they believed the underlying message of the film was significant enough to warrant the violence. Marco Beltrami returned to helm the score for Scream 2 though there would be a late inclusion by Danny Elfman in the form of the choral track "Cassandra Aria" which plays during a scene where Campbell's character performs in a play and again in the film's finale as "Cassandra Aria Reprise". Excerpts from the score of the 1996 film Broken Arrow by Hans Zimmer appeared in the film, in particular guitar work by Duane Eddy, for the character 'Dewey', replacing the tracks that had been developed for the character from the original Scream score. Beltrami would explain in an interview that the Zimmer piece was used as a placeholder for Beltrami's incomplete score during a test screening. The test audience reaction to it influenced the studio to keep the Zimmer piece, reducing "Dewey's Theme", which Beltrami had composed to fill its place, to minor use during more serious scenes involving the character. In 1998 Varèse Sarabande released a 30-minute album with music from Scream and Scream 2, and in 2016 Scream 2: The Deluxe Edition was released including the Elfman material and the complete Beltrami score. Scream 2 held its premiere on December 10, 1997 at Graumans Chinese Theater in Hollywood followed by a general release on December 12, 1997, less than a year after the release of Scream. After the unexpected success of Scream, by late 1997, Scream 2 was considered such a potential box office success that the James Bond film Tomorrow Never Dies and James Cameron's future hit Titanic were moved from their release date of December 12 to December 19 so as to not face the film as competition. Scream 2 opened in 2,663 theaters and took $32,926,342 on its opening weekend in box-office receipts, a $27 million increase over Scream, and went on to take $101,122,258 in the US with, as of 2011, a worldwide lifetime gross of $172,363,301. Scream 2 enjoyed financial success on par with Scream despite its rapid production time and issues with script rewrites, their worldwide box office takings deviating from each other by less than $1 million; Scream with $173,046,663 and Scream 2 with $172,363,301. However, the film saw its US takings perform lower than the original's while its foreign takings increased. Scream 2 is currently the 520th highest-grossing film worldwide, behind Scream but ahead of Scream 3 and is the second highest-grossing film in the slasher genre, again behind Scream but ahead of Scream 3. Scream 2 was the 21st highest-grossing film of 1997 despite competition from blockbuster films such as Titanic and Men in Black. 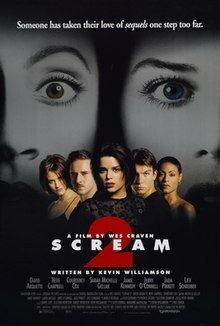 With $33 million, Scream 2 broke December opening weekend records for its box-office takings and held the record until December 15, 2000, being replaced by What Women Want (2000). On review aggregator Rotten Tomatoes, Scream 2 has an approval rating of 81% based on 75 reviews and an average rating of 6.8/10. The site's critical consensus reads, "As with the first film, Scream 2 is a gleeful takedown of scary movie conventions that manages to poke fun at terrible horror sequels without falling victim to the same fate." On Metacritic, the film has a score of 63 out of 100 based 22 critics, indicating "generally favorable reviews". On CinemaScore, audiences gave the film an average grade of "B+" on an A+ to F scale. Both Gene Siskel and the New York Times' Janet Maslin gave the sequel positive reviews despite their negative response to Scream; Maslin remarked that Scream 2 almost works as straight satire. It's so sharp—pardon the expression—that no pretty young things absolutely had to die." Roger Ebert stated the film was "about as good as the original" but lamented that "[Scream 2] is gorier than the original, and that distracts from the witty screenplay." Time Out London was mixed in its response, calling the film superior to most other horror films but poor in comparison to Scream, while Variety, scathing of Scream before its release, positively received the sequel, saying "[characters] ponder whether any sequel ever topped the original. Scream 2 is certainly worthy of being part of that debate." Empire's Kim Newman echoed this sentiment saying "Some great comic—and terrifying—moments, but suffers for not being as original as the original" remarking that though the film had the same elements that made Scream a success, they were no longer surprising for having been in Scream. There was however criticism over the death of the character Randy Meeks played by Kennedy. John Muir, author of Wes Craven: The Art of Horror called the character's death the "most devastating moment of the sequel" and a "bad call" but praised the development of the other surviving characters from Scream, calling Cox, Arquette and Campbell's characters "beloved". In contrast, Muir criticized all of the new characters in Scream 2, believing they never attained the same depth of the Scream cast because of Scream 2's focus on increasing the body count and violence over the original, saying that the film's killer could literally be anyone as the audience is never provided with enough information about the new characters to form an opinion about them. Ebert also commented upon this, saying "there is no way to guess who's doing the killing, and everyone who seems suspicious is (almost) sure to be innocent". Scream 2 won few awards compared to its predecessor with Campbell again receiving the most nominations and wins, having won two awards on Scream. She received a Saturn Award for Best Actress nomination and went on to win a Best Female Performance. Despite having only a brief cameo appearance as "Sidney Prescott" in the film within a film "Stab" shown in Scream 2, Tori Spelling became one of the nominees for a 1997 Razzie Award for Worst New Star. The film also received Saturn Award nominations for Best Supporting Actress for Courteney Cox and Best Horror Film for Scream 2 itself. Scream 2 was released in US territories on VHS on December 1, 1998 by Buena Vista Home Entertainment (distributed in Canada by Alliance Atlantis). Scream 2 was released on DVD for the first time in the US on July 22, 1998 with a Collector's Edition following on September 26, 2000 in "The Ultimate Scream Collection" and a separate release on August 7, 2001. The Collector's Edition featured additional material including outtakes, deleted scenes, the films theatrical trailer, music videos of songs featured in the film and directors' commentary. Both releases were undertaken by Buena Vista Home Entertainment. Following the release of then series finale Scream 3, the three films were collected in "The Ultimate Scream Collection" by Dimension Films on September 26, 2000, in a boxset containing "Behind the Scream", a short documentary about the production of the three films and additional material including screentests of actors involved in the films, outtakes and deleted scenes. Scream 2 remained unreleased in foreign territories including Europe and Japan until 2001 where it was released simultaneously with Scream and Scream 3 on February 26 by Buena Vista Home Entertainment. Each film contained the additional content found in the Collector's Edition version of their US release including deleted scenes, outtakes, theatrical trailers, music videos and commentary from each respective films crew. Additionally, the three films were collected together in a single pack, again released on February 26 and released as "Scream Trilogy". Scream 2 was released individually and in a collection with Scream and Scream 3 on Blu-ray Disc on March 29, 2011, two weeks prior to the theatrical release of Scream 4, by Lionsgate Home Entertainment. In addition to the films, each release contained audio commentary, theatrical trailers and behind-the-scenes footage. The Scream 2 original soundtrack was released November 18, 1997 by Capitol Records, a division of EMI. The soundtrack consists of 15 songs by various artists from the R&B, Rap and Rock genres, all but two of which - "One More Chance" and "The Race" - appear in the film. The album spent ten weeks on the Billboard 200, rising as high as #50, performing significantly better than the Scream original soundtrack which never charted. Music guide AllMusic however scored the album lower than its predecessor, awarding it only 2 stars out of 5. AllMusic's Stephen Erlewine was highly critical of the album, believing the content was an attempt to compensate for the previous films lack of a hit soundtrack, but the attempt had failed, creating an "uneven" album of songs not "good enough to make [the artists'] own albums", awarding it only 2 stars out of 5. Only one song featured in the film did not appear on the album, the original work, "Take Away the Fear", written and performed by Craven's own daughter Jessica Craven and Mike Mancini, which plays on a TV during an early scene in a sorority house involving Sarah Michelle Gellar. On February 4, 1998 Scream 2: Music from the Dimension Motion Picture was certified gold by the Recording Industry Association of America, signifying that the album achieved sales in excess of 500,000 units. The Scream 2 original score was, as in Scream, developed by Marco Beltrami and was released on July 14, 1998 by Varèse Sarabande on a CD which also contained tracks from the score of Scream entitled "Scream/Scream 2". The commercially released score for both films was found to be lacking many pieces heard in either film, consisting of only nine tracks – "Stage Fright Requiem", "Love Turns Sour", "Cici Creepies", "Deputy for a Friend", "Hollow Parting", "Dewpoint/Stabbed", "Hairtrigger Lunatic", "Sundown Search" and "It's Over, Sid" – with a runtime of only 17 minutes, compared to nearly 90 minutes of score developed for the film and the more common 30–45 minutes of music found in other original scores. The release was also found to be missing the track "Cassandra Aria" by Danny Elfman, described by soundtrack-review site Filmtracks as "a frenzied, choral-enhanced three minutes". The length of the released score was considered disappointing with some reviews considering the track omissions the result of the high fees required to be paid to composers in order to release their music commercially. The influence of several other famous composers could be heard in the score including Hans Zimmer, Elliot Goldenthal, Ennio Morricone and Christopher Young. In particular excerpts of the Hans Zimmer's score to Broken Arrow, particularly the tracks "Brothers" and "Secure", featuring guitar work by Duane Eddy, would become a component of the theme tune of the character Dewey Riley. Filmtracks was complimentary to the score, appreciating Beltrami's evolution of his work in Scream but remarked that the most memorable music of the film would be from other composers, Elfman's contribution "Cassandra Aria" and the samples from Zimmer's score, finding the replacement of Beltrami's work for the Dewey character with Zimmer's work "effective". Ultimately, the album was called unsatisfying without Elfman's piece and it was awarded 2 stars out of 5. The music guide AllMusic was more complimentary of Beltrami's contribution, saying the score "perfectly captured the post-modern, hip scare-ride of the Scream movies", and awarded it 3 stars out of 5. ^ a b "Scream 2". American Film Institute. Retrieved March 9, 2016. ^ "Scream 2 (18)". British Board of Film Classification. February 2, 1998. Retrieved October 16, 2016. ^ a b "Scream 2 (1997)". Box Office Mojo. Retrieved September 13, 2016. ^ a b c d e Shapiro, Marc (January 1998). "Super-Secret Scream 2". Fangoria (169): 20–25, 82. ^ Kevin Williamson (1997). "Scream 2 screenplay by Kevin Williamson". Internet Movie Script Database. Retrieved March 15, 2011. ^ a b Mullins, Travis (December 12, 2017). "Exclusive: Scream 2's Jerry O'Connell and Kevin Williamson Talk Leaked Scripts and Different Killers!". Dread Central. Retrieved December 15, 2017. ^ a b Diana Rico (October 31, 2001). E! A True Hollywood Story: Scream (Television Production). United States: E! Entertainment Television. ^ a b Garcia, Chris (March 1997). "One Last Scream". Fangoria. Starlog Group Inc. (160): 20–23. ^ a b c d Muir, John Kenneth (February 24, 2004). Wes Craven: The Art of Horror. McFarland. ISBN 0-7864-1923-7. ^ a b Spelling, Ian (May 1997). "Scream and Scream Again". Fangoria. Starlog Group Inc. (162): 66–68. ^ a b c Wes Craven (September 26, 2000). Behind the 'Scream' documentary from Ultimate Scream Collection (DVD). United States: Dimension Home Video. ^ a b c d e f Wes Craven (Director) (December 12, 1997). Scream 2 - Commentary by Wes Craven, Patrick Lussier & Marianne Maddalena (DVD). United States: Dimension Films. ^ Yahoo Movies (July 18, 2014). "Sequel Opportunity: 8 of the Fastest Follow-Ups in Film History". Yahoo.com. Retrieved January 23, 2019. ^ a b c Reeves, Tony. "Scream 2 film locations". Movie-Locations. Archived from the original on April 4, 2011. Retrieved April 4, 2011. ^ "Everyone loves a healthy debate". Atlanta. September 2007. p. 56. ^ Friday, Rachel Scott (October 27, 2010). "Is the NC-17 rating ruining the Oscars?". The Guardian. Guardian News and Media. Retrieved April 13, 2011. ^ "An Evening with Marco Beltrami on the Phone". www.bsospirit.com. Retrieved March 21, 2011. ^ Wayne, Gary (2011). "Locations of Hollywood Movie Premieres". Archived from the original on April 4, 2011. Retrieved April 4, 2011. ^ a b c d e f g h i "Scream 2 (1997)". Box Office Mojo. IMDb.com, Inc.
^ a b "Scream (1996)". Box Office Mojo. IMDb.com, Inc.
^ a b "WorldwideBoxoffice (in millions of U.S. dollars)". Box Office Mojo. Retrieved March 16, 2011. ^ "Scream 2". Rotten Tomatoes. IGN Entertainment, Inc.
^ Maslin, Janet (December 12, 1997). "FILM REVIEW; Help! He's Back! Run! Shriek! Tempt Fate!". New York Times. Retrieved April 16, 2011. ^ Ebert, Roger (December 12, 1997). "Scream 2". Rogerebert.com. Retrieved April 17, 2011. ^ Adams, Derek. "Scream 2 (1997)". Time Out Group Limited. Archived from the original on October 18, 2012. Retrieved April 17, 2011. ^ Leonard, Klady (December 7, 1997). "Scream 2". Variety. Archived from the original on April 18, 2011. Retrieved April 18, 2011. ^ Newman, Kim. "Scream 2 (1997)". Empire Magazine. Retrieved April 17, 2011. ^ Ebert, Roger (December 12, 1997). "Scream 2". Chicago Sun Times. Retrieved April 1, 2011. ^ "1998 MTV Movie Awards". mtv.com. Retrieved March 14, 2011. ^ "Ninteenth [sic] Annual RAZZIE® Awards (for 1997)". MTV. March 22, 1998. Retrieved April 16, 2011. ^ "Scream 2 [VHS] (1997)". amazon.com. Retrieved April 2, 2011. ^ "Scream 2 - Original Soundtrack". Retrieved March 18, 2011. ^ "Scream - Original Soundtrack". Retrieved March 18, 2011. ^ a b c Thomas Erlewine, Stephen. "Scream 2 Original Soundtrack Review". Retrieved March 18, 2011. ^ a b Clemmensen, Christian (July 21, 1998). "Scream/Scream 2". Retrieved March 18, 2011.